October 14-19, Fall Fly Fishing class, five days of instruction and guided fishing offered by Healing Waters Lodge, Twin Bridges, Montana. Fall fly fishing class also includes 6 night stay at the lodge and all meals for $2,995. Call Mike Geary today at 406-459-2030 for details. 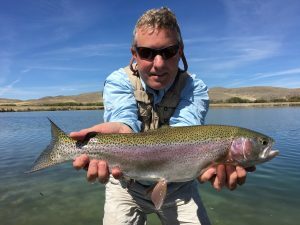 Photo: Healing Waters guest, Harlan, with a magnificent Rainbow caught on private water.